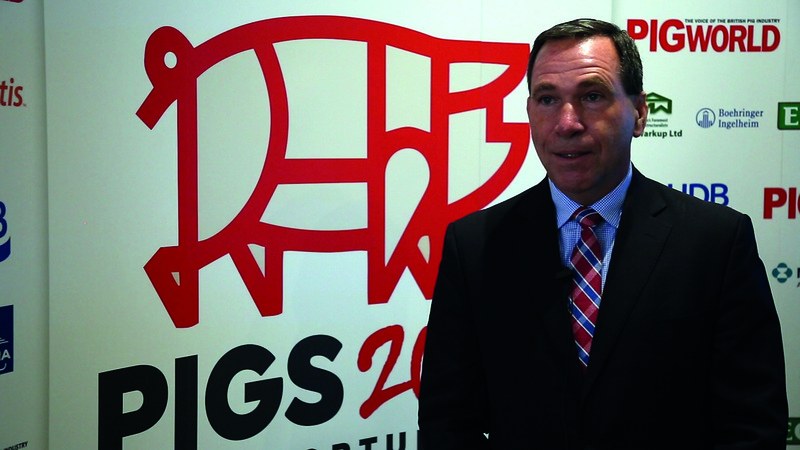 A leading figure in the US pork industry urged the UK to look beyond the EU when it comes to establishing new post-Brexit trading relations. During a question and answer session, Nick Giordano, vice-president of the US National Pork Producers Council, made no effort to hide his disdain for Brussels and the NGOs he believes have unfairly demonised US pork production. US pork exporters have been largely kept out of the EU market, partly due to concerns over production methods, such as the use of the feed additive ractopamine. Asked whether the US industry might have to compromise in order to access the EU market, or, post-Brexit, the UK, Mr Giordano said pork producers had lost interest in US-EU TTIP trade talks, preferring to focus on Asia, and particularly Japan, instead. “I get it, you (the UK) are dependent on the EU. But do you really want to be married to the Brussels model? Isn’t there room for producing what goes into the EU to Brussels-spec and being open-minded with the US and your other trading partners? Asked whether the move by 60 US companies to remove sow stalls ‘might create more opportunities than risks’, he insisted producers ‘should not be dictated to in this way’. He accused NGOs campaigning on such issues of ‘corporate extortion’ in their demands of retailers and restaurants. “We want producers to be free to operate and use the processes they want to as long as they are, broadly speaking, safe for humans and animals,” Mr Giordano added. “The question is: is it science-based or even necessary? And does it result in dearer food? * A growing global population and US Free Trade Agreements that have removed barriers and allowed US producers ‘to outcompete the competition’. “US pork producers will continue to be leaders in supplying pork to the world and will continue to compete with EU products in key markets,” Mr Giordano said. The UK pig industry was urged to push the Government hard to ensure transitional arrangements are put in place to minimise the damage of leaving the EU without a trade deal in place. Bruce Ross, an independent Brussels-based agri-food consultant, said the timetable was simply too tight for a working Free Trade Agreement (FTA) to be secured by April 2019. If the UK leaves the Single Market and Customs Union then without an FTA in place, it would pay tariffs to export to the EU, ranging, for pork, from €172/tonne to €1,494/t, depending on the cut, and potentially wiping out the lucrative German sow market. Even more costly could be the non-tariff costs, including proof of origin, veterinary and customs checks at border points and the need for various extra licences and certificates, all of which would cost money and time, and incur border delays. The UK would also lose the benefit of the EU’s existing FTAs. It could re-negotiate them, but this would take time, Mr Ross warned. The good news is that it is in the EU’s interests to secure an FTA, too, he added, pointing out how the current pork trade benefits both sides.